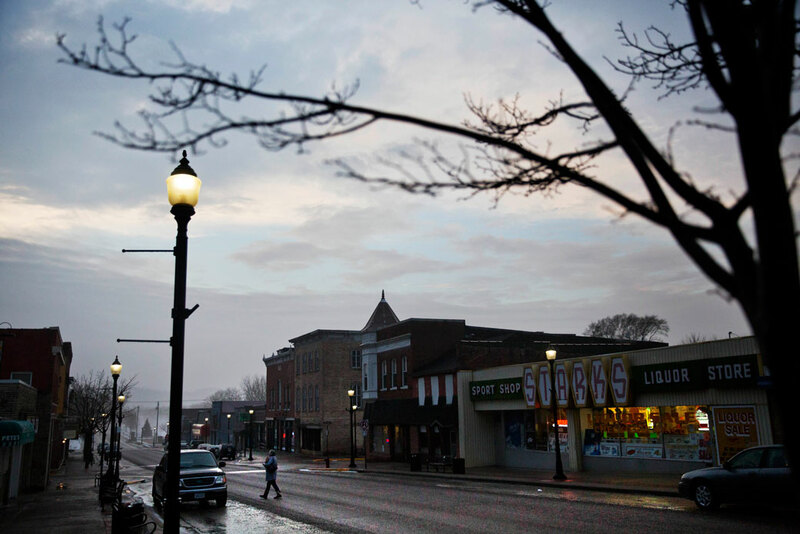 A customer crosses the street while leaving a shop along the main business district in Prairie du Chien, Wisconsin, January 2017. The economy is not producing access to a good, stable middle-class life for people who do not go to college. On prudential and ethical grounds, progressives must do more to create decent job opportunities and secure family situations for all working people facing difficult economic conditions not within their control. The past few years have been marked by disruptive elections and political upheavals across the Western world. In the United States, the election of Donald Trump was preceded by the Brexit vote in the United Kingdom and followed by the far-right National Front making the second round of voting in France’s presidential election. 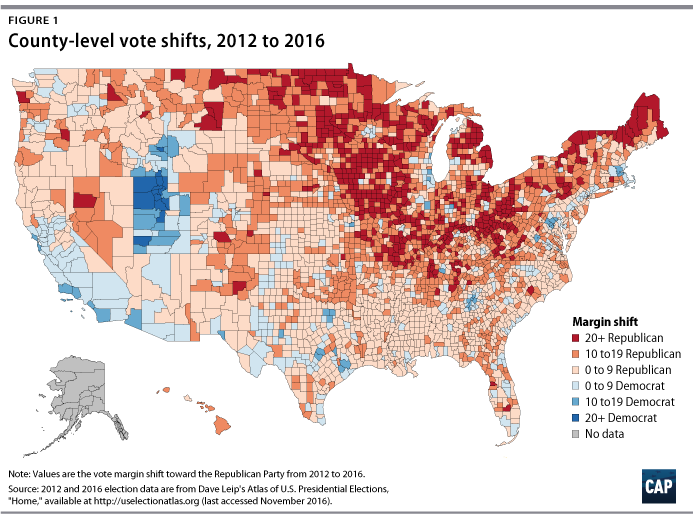 Since the U.S. election, there has been widespread discussion about the causes of the electoral shift from the decisive win for Barack Obama in 2012 to Trump’s win in 2016. Political analysts richly debate whether economic or cultural anxiety played the most critical role. While the election was decided by a small number of votes overall, there was a significant shift of votes in counties in critical Electoral College states, including Iowa, Michigan, Ohio, Pennsylvania, and Wisconsin. Opinion formation among voters is a complex process and it is important to consider how multiple factors—social, cultural, economic, and political—interacted last year to shape political outcomes. For example, as a recent study by the Public Religion Research Institute (PRRI) shows, concerns about cultural displacement appear to have played a powerful role in driving white working-class voters toward Trump.1 However, cultural beliefs that America was better in the 1950’s may include concerns about demographic and social changes in the country as well as ongoing economic uncertainty among white working-class men who have not experienced material income increases since the 1980s. We need to better understand the full range of voters’ attitudes, even if we do not agree with all of their premises. Indeed, because progressives can never “out racialize” Trump and his forces by trying to appeal to social attitudes antithetical to our values and history, our future strategy requires more concentration—not less—on economic concerns. And in fact, we find that attitudes about both economic and cultural decline—particularly among older white working-class voters, though not exclusively—worked in tandem to fuel populist and nationalist uprisings last year, most notably in the United States and the United Kingdom. While the National Front won only about one-third of the vote in the second round of the French presidential election, the vote was closest between Emmanuel Macron and Marine Le Pen amongst voters without a college degree, with record numbers of abstentions among these nondegree voters.2 Across many developed nations, including the United States, political conditions look much the same: Traditional working-class or noncollege-educated electorates are deeply unsettled, angry, and opposed to politics and policies that appear indifferent to their concerns. At the same time, rising inequality and ongoing racial and ethnic inequities in American society and other nations continue to drive social isolation, anger, and discontent among younger, less wealthy, and more diverse voters who see a status quo system failing to address their needs, even as they bear the brunt of these disparities. While those voters may not vote for the right, they may choose to not vote at all. However, discussions of broad inequality may mask a central truth: There is acute economic pain for those who have not gone to college, regardless of race. Amongst white voters in the U.S. election, college attainment was the central variant in vote change from the 2012 to the 2016 election. These underlying economic and social grievances, and the political forces feeding these sentiments, work against progressive policy options by reducing support for collective action that improves the well-being of all people while encouraging divisions that serve more individualistic and conservative ends.3 Reactionary forces on the far right—most notably, Donald Trump and his allies—have exploited to full effect the rising tensions between divergent groups, producing a zero-sum political climate where the gains of rising minority populations are perceived to come at the loss of shrinking white populations. But this is a false choice. Indeed, we must not choose between addressing the economic concerns of people—of all races—who have been left behind by our economy and protecting the civil rights of people of color. We can and must do both. As progressives, we must fight for and represent the economic and social interests of all working people. The reality, as this report demonstrates, is that people who have not gone to college have been particularly vulnerable in this economy for a long time. Progressives should care about the lost opportunities in Appalachia as much as those in Detroit. The economy is not producing access to a good, stable middle-class life for people who do not go to college, and those voters are likely to continue to disrupt the political system until it does. On prudential and ethical grounds, we must do more to create decent job opportunities and secure family situations for all working people facing difficult economic conditions not within their control. This is not simply a matter of messaging or a problem of persuasion but rather a challenge that requires bold thinking and answers outside the current political system. Examining CAP’s own combined file of county-level voting patterns and demographic data, we find that counties with significant white noncollege-educated populations shifted more heavily toward Trump, while counties with more college-educated whites and minorities shifted toward Hillary Clinton.5 As seen in Figure 1, the deepest red counties indicating larger shifts toward Trump are concentrated in more rural areas primarily off the coast from the Northeast down to Appalachia and up through the Midwest. As Figure 2 confirms, many of these counties have significant white noncollege voting populations. Again, the educational divide between college and noncollege, particularly among white voters, was the key variable shaping the 2016 election. The political consequences of these trends are obvious: Many of these heavily white working-class counties with the biggest shifts toward Trump were concentrated in states such as Iowa, Michigan, Ohio, Pennsylvania, and Wisconsin, which ultimately determined the Electoral College. 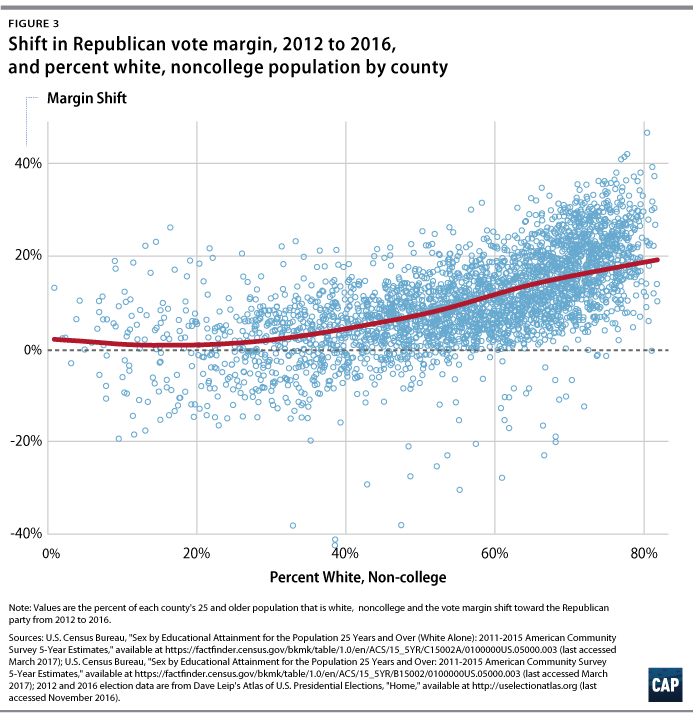 And as Figure 3 shows, there is a strong correlation between the percentage of white noncollege-educated voters in a county and a shift toward Trump. Although we cannot directly infer voting behavior using county-level analysis alone, these patterns correspond to what we know about white working-class voting behavior from surveys conducted both before and after the election. What was going on in these heavily white working-class counties that might explain support for Trump? Without diminishing the importance of cultural and racial influences, it is clear to us that lingering economic pressures among important voting blocs helped to create a larger opening for Trump’s victory. Our own analysis of voting trends confirms that the counties with the lowest number of routine jobs shifted toward Trump less than the areas where routine jobs were more prevalent. Combined, these studies suggest that voters in areas with large numbers of jobs subject to pressures from deindustrialization and automation were particularly receptive to Trump’s message of economic nationalism and his promises to fight globalization and political elites who traded away American jobs. On the other side of the equation, looking at turnout data from state voter files in Florida and North Carolina, we also see evidence of diminished turnout by young people and African-Americans. Since these voters were critical to President Obama’s success in 2012, any decline in turnout likely amplified Trump’s advantage among white noncollege voters. And although Hillary Clinton’s strong showing with white college-educated voters improved upon Obama’s 2012 margins and outstripped many other Democrats, this advantage was not enough to offset the massive gains for Trump among the white noncollege electorate. We do not yet know the exact reasons for the drop in turnout among young people and black voters. But with President Obama not on the ticket to drive voter enthusiasm, it is quite possible that lingering job and wage pressures in more urban areas with lots of young people, and in areas with large populations of African-Americans, yielded similar, if distinct, economic anxiety in ways that may have depressed voter turnout among base progressives. The combined effect of economic anxiety may have been to drive white noncollege voters toward Trump and to drive down voter engagement and participation among base progressives. Either way, issues related to lost jobs, low wages, high costs, and diminished mobility played a critical role in setting the stage for a narrow populist victory for Trump. So what has happened to working-class people across America—and what should progressives do about it? All these developments have added to the longer-term economic disadvantage of this segment of the labor force. 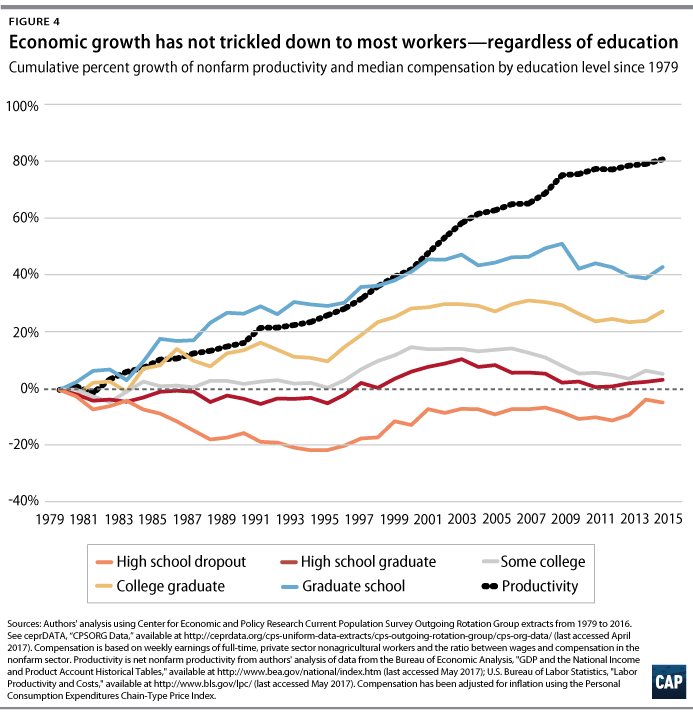 Between 1979 and 2000, real compensation for those without a bachelor’s degree grew just 4 percent, while compensation for those with at least a bachelor’s degree grew 31 percent. The employment trend has also been discouraging: The jobless rate for prime-age men without a college degree grew by one-third, from 10 percent to 13.3, percent between 1979 and 2000. In addition, ongoing technical change has increased the automation of many forms of work and increased demand for highly skilled workers relative to low-skilled workers. This has created what some economists have characterized as a race between education and technology, which disadvantages those who are less highly trained.14 These tendencies may be amplified as applications of artificial intelligence increase. Technical change has played a role in the declining share of the workforce employed in manufacturing. Between 1970 and 2000, U.S. manufacturing output grew, while manufacturing employment remained approximately stable because productivity increased. 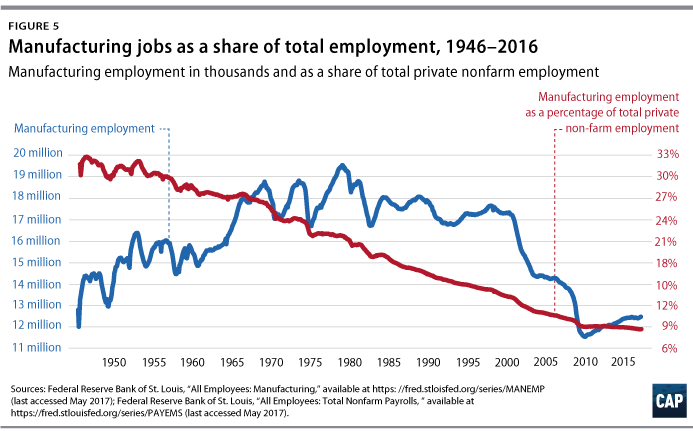 This reduced the share of total nonfarm employment in manufacturing from around 25 percent in 1970 to around 13 percent in 2000. These changes meant that there were fewer high-paying manufacturing jobs relative to the total labor force. And this made it more difficult for those without a university education to earn higher wages. In order to address these economic deficiencies, the Center for American Progress is putting together a new commission to help design a national “Marshall Plan” to rebuild hard-hit communities through increased economic growth; more jobs with better wages; and rising opportunities and increased security for families. In the wake of World War II, the United States famously undertook the Marshall Plan to invest billions of dollars in war-torn European countries to rebuild their economies and modernize their industries. This was not only in the interest of Europe but also of America itself as the world’s largest economy and global leader against the spread of communism. Evoking the strategic leadership the United States demonstrated 70 years ago, a domestic Marshall Plan today for hard-hit communities would both help struggling families and individuals directly and strengthen America’s national economy through revitalizing communities that have great potential to contribute to our economic and social fabric. The commission will be composed of national, regional, and local leaders who can provide direction and visibility to its work. It will call upon the expertise of urban and rural leaders who represent labor, business, education, health, faith, community and economic development, and racial justice to help understand the problem; lift up promising practices; and develop bold new ideas, particularly for people who did not attend college. Amidst overall economic growth, urban centers, small towns and rural areas, and regions facing deindustrialization have suffered decades of neglect, leading to widespread frustration and disillusionment with Washington and spurring voters to either stay home or take a chance on a candidate who promised to blow up the system. In the aftermath of an election in which rural and urban voters came to view one another with suspicion while both suffered from decades of disinvestment, the time is ripe for a policy agenda and accompanying message that underscores the common cause among struggling Americans and outlines solutions that unite them. What follows are a few big areas of investment we expect the commission to explore in its work. Throughout the process, these ideas can be further developed and refined with input from members of the commission and other experts. We propose today a new jobs guarantee, and we further expect a robust agenda to be developed by the commission. It is clear, however, that effective solutions must recognize the importance that Americans attach to the dignity of work. Economic frustrations arise when work at a living wage becomes impossible to find. A successful economic policy will be one that delivers better employment and better wages for those who have been marginalized by the market economy. The low wages and low employment rates for those without college degrees only exist because of a failure of imagination. There is no shortage of important work that needs to be done in our country. There are not nearly enough home care workers to aid the aged and disabled. Many working families with children under the age of 5 need access to affordable child care. Schools need teachers’ aides, and cities need EMTs. And there is no shortage of people who could do this work. What has been missing is policy that can mobilize people. To solve this problem, we propose a large-scale, permanent program of public employment and infrastructure investment—similar to the Works Progress Administration (WPA) during the Great Depression but modernized for the 21st century. It will increase employment and wages for those without a college degree while providing needed services that are currently out of reach for lower-income households and cash-strapped state and local governments. Furthermore, some individuals may be hired into paying public jobs in which their primary duty will be to complete intensive, full-time training for high-growth, in-demand occupations. These “public apprenticeships” could include rotations with public and private entities to gain on-the-ground experience and lead to guaranteed private-sector employment upon successful completion of training. Such an expanded public employment program could, for example, have a target of maintaining the employment rate for prime-age workers without a bachelor’s degree at the 2000 level of 79 percent. Currently, this would require the creation of 4.4 million jobs. At a living wage—which we can approximate as $15 per hour plus the cost of contributions to Social Security and Medicare via payroll taxes—the direct cost of each job would be approximately $36,000 annually. Thus, a rough estimate of the costs of this employment program would be about $158 billion in the current year. This is approximately one-quarter of Trump’s proposed tax cut for the wealthy on an annual basis. This cost estimate is useful for determining orders of magnitude, although it is not precise. An effective employment program would need to provide paid training when needed to allow workers to transition to a designated type of employment. At the same time, the effects of increased employment would reduce current expenditures on unemployment insurance, Supplemental Nutrition Assistance Program (SNAP) food support, and other social programs. In addition, the expansion of employment would have a multiplier effect on overall income and tax revenue. The wage and employment effects that have disproportionately hurt workers without university training have also had large impacts on the communities in which they live. Declines in wages and employment have made it difficult for many communities to support the institutions that serve as anchors of the local economy, and which provide the channels for economic mobility. For example, research indicates states and local school districts are underinvesting in capital construction and maintenance by at least $46 billion annually.20 Additionally, school districts currently have more than $400 billion in outstanding debt, principally issued for financing capital projects. Moreover, in many parts of the country, particularly in rural areas, there are child care deserts where child care facilities are unavailable. By spending $50 billion each year for 10 years to provide a combination of grants and low-cost financing to support school modernization and expansion and build child care facilities, pre-K through 12th grade schools can be brought up to 21st-century standards. A bold jobs plan will not come at the expense of the civil rights of any group—in fact, it will buttress these rights. To make progress on both fronts, we need far-reaching policy solutions to create family-sustaining jobs and better prepare workers to fill them, particularly in communities hit hard by offshoring, automation, and growing market concentration. Additionally, these solutions and jobs need to reach the communities that were left behind long ago. These areas should be our top priority over the next few years. President Trump and conservative policies take us backward from the goal of creating strong and secure communities and families while simultaneously stripping health care from millions of Americans; concentrating economic power at the expense of working families; and giving more tax breaks to the wealthy and corporations. But critiquing conservative policies is not enough. Progressives must articulate a vision for the future grounded in good jobs with good wages and stand up for a government that serves and helps all Americans. The truth is, progressives should be as concerned about the declining fortunes of those who do not go to college as any other group. Not because they are disrupting politics—though they are—but because they are our brothers and sisters too. An economic vision that puts the challenges of the noncollege educated at the forefront of our policies will help us to carry out our progressive values and build a Bobby Kennedy-style coalition—one that can unite working people of all races behind an agenda to improve their economic security, reduce divisions between groups, and improve the standing of the nation as a whole.